There was a time when wore paperback copies of Catcher in the Rye was in the back pocket of most teenagers. Written in 1951, it's hard to imagine these new century teens reading this on their own unless it's a subject requirement to graduate. It's a shame because Holden Caulfield's angst and alienation is a universal theme that many can relate. Danny Strong who wrote and is making his directorial debut in this new feature on the life of J.D. Salinger. The story revolves around the time when he creates and refines Holden while he was a student at Columbia and during his life altering experience in the war. 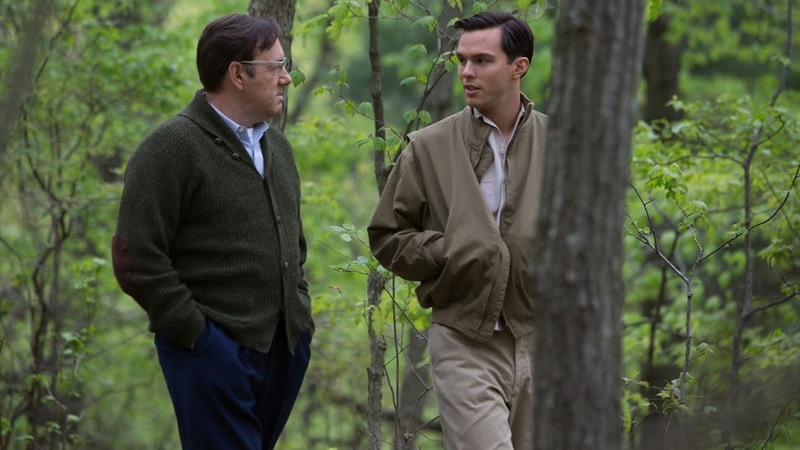 Salinger (Nicolas Hoult) as an adult was reclusive and disdained the public eye. All the public relations, meetings and dinners, rabid fans kept him at his upstate country acreage. But as a young man, he as flirtatious with pretty women like Oona O'Neill (Zoey Deutch) who later married Charlie Chaplin. He was also set on being a writer. His mother (Hope Davis) believes he is immensely talented, while his father (Victor Garber) discourages his dreams preferring that we would pursue a career in business. 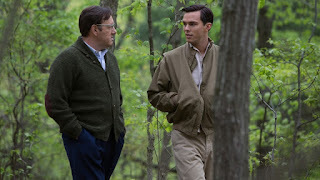 He ends up going to Columbia in their writing program which is taught by Whit Burnett (Kevin Spacey) who challenges Salinger by criticizing his admittance letter. He asks his wise mouthed student, "Why do you write?". When he can figure out that answer, then maybe one day he can be published. Salinger is determined and he submits his short stories to various publications only to be rejected. Whit who published Story magazine eventually published the first story he had submitted. Seeing the potential in his character of Holden in another short story, he encourages Salinger to expand it to a novel. The war breaks out and Salinger is in the thick of things. The only thing that keeps him together is writing every moment he can manage. He returns home with a wife in tow, which doesn't last long. He suffers PTSD, spending time in a sanatorium. He can't seem to bring himself to write again. His book agent, Dorothy Olding (Sarah Paulson) manages to get his anthology of shorts published. He had previously asked Whit to publish him but he said he couldn't and they had a falling out. Salinger discovers meditation and finds a guru, that helps him clear his mind and start writing again. After he writes Catcher in the Rye, his publishers give him lots of criticism. They don't understand Holden. So he hold off until he finds someone to publish and the rest is history. So little is known of Salinger because he notoriously kept his life out of the limelight. At a certain point he said he would continue writing but he would never publish again. Danny Strong's script was taken from the book J. D. Salinger: A Life by Kenneth Slawenski. This film just briefly touches on the events of Salinger's life, but his creative process is missing. Whit who often told him his stories felt phony encouraged him to find the truth of his characters. Outside of the good performances, something about this biographical story doesn't quite gel.